Shirley Temple Black, born April 23, 1928, served her country in vastly different ways. As a child star in the late 1930s, she cheered up a nation suffering the effects of the Great Depression, making 20 movies by the time she was six years old. Born April 23, 1928, Shirley Temple was known for films such as “Bright Eyes,” “Curly Top” and “Heidi” as well as songs including “On the Good Ship Lollipop” and “Animal Crackers in My Soup.” She ended her acting career at the age of 22 but would return to the spotlight in service to her nation later in life. In 1968 she was at a conference in Prague when the Soviets invaded. The beginning of her diplomatic career came shortly thereafter, when President Nixon appointed her as a delegate to the United Nations. 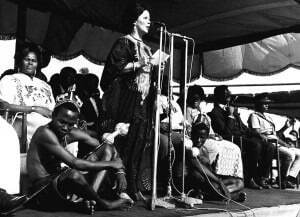 President Ford named her ambassador to Ghana in 1974, and later as his Chief of Protocol, the first woman to hold that job. In 1989, President George H.W. Bush named her ambassador to Czechoslovakia, just a few months before communist rule was overthrown. 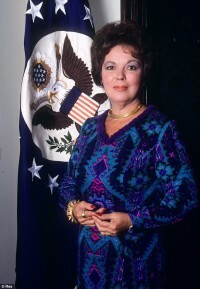 President Reagan asked her to direct the Ambassadorial Seminar at the Foreign Service Institute and she served as a member of the Board and Advisory Council of ADST. She died February 10, 2014. Shirley Temple Black is remembered by Kenneth C. Brill, who was interviewed by Mark Tauber in April 2016, by Thomas Hull, who spoke to Daniel F. Whitman in January 2010, and by John Evans, interviewed by Charles Stuart Kennedy in October 2009. Read about other Fascinating Figures related to entertainment including Kathleen Turner and Oliver Platt, and to learn more about Africa, Eastern Europe and the fall of the USSR. I arrived in Ghana — her first ambassadorial assignment; she subsequently had a second one in the Czech Republic — a month or so before Secretary Henry Kissinger was supposed to arrive at post. The post was really focused on preparing for Kissinger. As the junior-most officer in that embassy, I was given the really fabulous job of organizing the Secretary’s motorcade. As it turns out, that would have been a career killer, because his staff requested more vehicles for the visit than were available either in our embassy or any friendly embassies, and there were no rental car companies…. This would have been 1976. 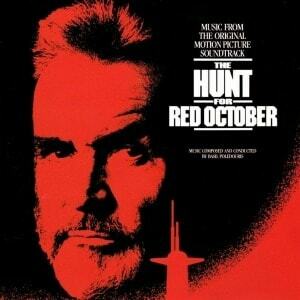 I had really limited dealings with Ambassador Black in my initial time in the embassy. She was focused on getting things organized for the Secretary. I was doing my part running around desperately trying to find cars while also trying to track down my missing air freight shipment. I had a brief courtesy call with her and she was very pleasant in welcoming me to the embassy. I never saw her outside the office in those early days and was never at the Residence or anything like that. She was well liked in the embassy. She had a very nice way with people and she also let her DCM (Deputy Chief of Mission) Jack Lenahan, who was a very experienced Africanist, run the embassy on a day-to-day basis. There was a very clear line; she was the CEO (chief executive officer), he was the COO (chief operations officer). It seemed to me as a brand new person that the embassy was running well. Ambassador Black was also very popular in Ghana. She had been made an honorary chief in a village near Accra, Ghana’s capital. She seemed to receive positive press coverage, which in Ghana at that time, for the U.S., was not easy. The Ghanaian press in those days tended to be pretty stridently anti-American. And when it was not attacking the U.S. it featured sensational stories that were only loosely tied to reality. But despite all that, Ambassador Black always seemed to be treated well in the press and always got a photograph. Every time I remember seeing any article that related to her in The Ghanaian Times or some of the other more scurrilous newspapers there was always a photograph, because she photographed well and people liked her. In many ways she was an ideal ambassador for a country like that because she arrived with a very positive persona. People would [say] “Oh! 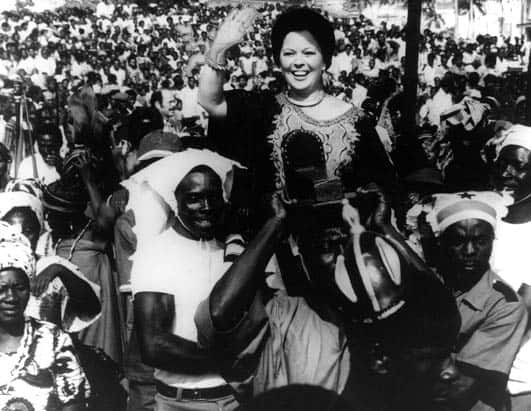 Shirley Temple!” And she had the skills to use that opening with her direct interlocutors and the larger public when delivering a positive message about the U.S. and U.S.-Ghanaian relations…. Her films had a truly global audience and reach. That might not seem remarkable in today’s wired world, but her films were made and distributed many decades before the internet. Because she had been so well known for so long, she was a private person. When she was working, my impression was that she was very focused and professionally outgoing. That was certainly the impression I got from all of my colleagues in the embassy. She took her work seriously; she was focused on it when she was doing it. When she was in the office she was personable, charming, and she had a smile that literally would light up a room — and she smiled relatively easily. She was not a sour kind of person by any means. But when she was off the job, she kept to her family. The Residence pool was not open to the embassy staff, something that changed when another ambassador came. But that was just the way she was; she was private. Given her background, one can understand why she would value her privacy; she hadn’t had much from the time she was probably four years old or five years old…. Shirley Temple Black was charismatic. She was a very short person, perhaps five feet all (or an inch or two more). But carried herself with great confidence. 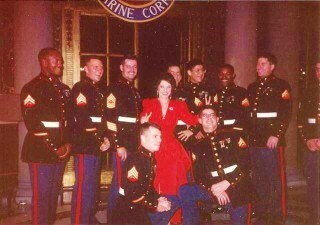 She had great posture and always wore boots that had stacked heels to add a couple of inches. What set her apart was her smile, which when I knew her in Ghana did not appear to have changed at all from when she was a much younger actress. If you saw her smile as an ambassador when she was in her 50s, and compared that with the smile that you would see in one of her films, it was the same delightful smile. Ambassador Black did a good job and had a successful assignment in Ghana, but it ended abruptly because of complications related to Secretary Kissinger’s visit. Secretary Kissinger was making his one trip to Africa and he’d given an important policy speech in Lusaka on the situation in southern Africa and U.S. policy for the region. That would be Rhodesia, now Zimbabwe, South Africa, and Namibia, then Southwest Africa, all of which were resisting the call for (and indigenous political movements dedicated to) black majority rule. 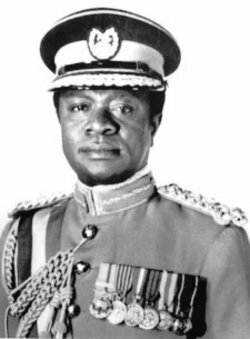 The head of the Ghanaian government, a very undistinguished army colonel named [General Ignatius Kutu] Acheampong, who was neither terribly bright nor accomplished in any way, withdrew the invitation for Kissinger to visit at the last minute, claiming diplomatic illness. I always thought, frankly, that he got cold feet because he finally came to the realization that he was going to sit across the table from Henry Kissinger and he didn’t know what the hell to say to him. Kissinger had the well-earned reputation as a world class intellect; Acheampong (seen right) did not. He didn’t take advice from the foreign ministry very well and was surrounded by a coterie of essentially military people. I think he just didn’t see that there was any benefit for him to have Kissinger visit, so he called it off. Kissinger didn’t take things like that well and as he flew over Ghana on his way to a scheduled stop in Liberia he sent a cable to Ambassador Black saying, “Come home.” So he pulled her out as a mark of his displeasure. It wasn’t a break in relations, but she was being called back to Washington for consultations. Ambassador Black lobbied in Washington to go back to Ghana to pay her farewell calls and finally wore down Kissinger or Kissinger’s staff. She received permission to return to Ghana along with her husband to pay her farewell calls and pack up her belongings without leaving it for the GSO (General Services Officer) to do. As the junior-most person in the embassy I went along on her farewell calls outside the capital as sort of an aide-de-camp. She received permission to use the C-12 [military designation for Beechcraft Huron aircraft] DAO [Defense Attaché Office] airplane to make her farewell calls in Ghana’s regional capitols. Those trips around the country were a good opportunity for me to see her in action and also to get to talk to her. There were three of us in her party on the plane: Ambassador Black, her husband and me; there was also a pilot and co-pilot. Mr. Black spent a good deal of time reading and doing work on the flights. Ambassador Black also did some work on the plane but she was also open to conversation, which I took advantage of. Ambassador Black really showed her people skills on the trip and also a sense of what it meant to be the U.S. ambassador. She carried herself very well, knew her brief and was skilled at delivering it. The U.S. relationship with Ghana was not one of our vital relationships by any means, but we had AID [Agency for International Development] projects, we had a variety of interests in the country and, of course, it was the Cold War and so everybody was trying to make sure we were one up on the Soviets. She delivered really effective messages about U.S.-Ghanaian relations — about whatever the AID project or other commercial activities that might be in the area — to the regional governor and to his staff, but also wove into that her happiness with the time she had spent in Ghana, her love of the Ghanaian people, how much she respected Ghana. She was really very skillful. Also, beyond being just an effective ambassador, presenting her points effectively, she was skilled at relating to people and she really made the people she was talking to feel like she was taking them into her confidence, that they were friends. She was very warm to them; she smiled easily and nicely. The photographs — “Can we have a photograph?” “Of course you can do the photograph.” Whether it was the senior person she was meeting or other staff on the way, or just people standing around outside, or even at the little airports where we would land. She was very, very skilled at that. Occasionally there would be a journalist or two and she would handle those encounters very well. Gifts were always exchanged. She was given little gifts, like a Kente shawl, nothing terribly big, but little things because people liked her and wanted her to have some memory of Ghana or their part of Ghana. I remember we were in Bolgatanga, which is the northernmost city in Ghana , near the border with what was then called Upper Volta, now Burkina Faso, and the governor gave a gift to Charlie, not just to Ambassador Black. The gift for Charlie was a cotton shirt in the style worn in northern Ghana. Mr. Black (seen right) was delighted to be involved in the gift exchange, so he took off his shirt to put on the Governor’s gift. This was the ceremonial part of the meeting, so there was some press in the room with us, and once Mr. Black took off his shirt, camera flashbulbs lit up the room. As everyone in the room and anyone who would see those photos would see, he was a tanned and very fit person. Mr. Black quickly put on the gift shirt and did not take it off again until we were back on the plane. The press did not seem that interested in him fully clothed, so the cameras stopped. It was very clear that she was much more used to dealing with the press, being in the public eye, and knowing what you do and don’t do with the press on a public occasion than he was. But he was enthusiastic and happy to go along with the spirit of the Governor’s gift giving. He got caught up in the occasion; Ambassador Black, on the other hand, was disciplined and very professional when she was in the public eye. During another leg of the trip, I was talking to her about one thing or another and Charlie leaned over and pointed to a story in the Wall Street Journal. It was a story about her. It just noted that she had acquired the last of the copyrights to her films that she didn’t have. She apparently owned the rights to the full library of her films. She had, over time, bought them. I asked her, “This may be an indiscreet question, but do you ever watch the films, for example, with your kids?” I don’t think she had grandchildren at that point. She looked at me, gave me this kind of little pout she could do, you would see it in her films, and said, “Ken, I don’t really care to see myself as a spunky little six or eight year old anymore.” OK. I got that. I found in my discussions with Ambassador Black during our time on the plane that she was a very shrewd political analyst, particularly of California politics, and we talked a lot about California politics since I had joined the Foreign Service while living in California and was very interested in the state’s politics. She’d run for Congress and lost, and had been close to Ronald Reagan both professionally and politically. I found her to be really well informed on the politics of California and on U.S. politics as well — very thoughtful, not doctrinaire, but pragmatic and interesting…. I’d been engaged when I was assigned to Ghana and I went back to the U.S. to be married after I had been there about a year. My wife, Mary, and I were married near Milwaukee, where her eldest sister lived. My wife had been running the Baltimore office of a large international shipping company, but she took a leave from that to come live with me in Ghana. On the way to Ghana, we had to get her a diplomatic passport and complete a bunch of other paperwork so she could be authorized to travel to Ghana as my wife. 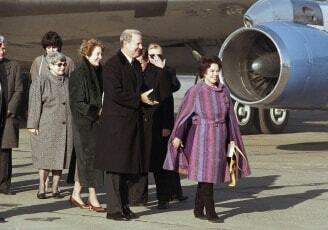 (Shirley Temple Black sworn in as Chief of Protocol with President Ford in 1976 at right). Pat Kennedy (Patrick F. Kennedy, currently the Under Secretary of State for Management) was then the post management officer for West Africa, and Pat got everything done quickly and well as he always did, and still does today. So we went in and I introduced Ambassador Black to Mary and she came across the room and gave Mary a big hug. Mary will never forget she got a big hug from Shirley Temple. Ambassador Black was very happy to see us and asked, “What’s happening in Ghana? You’re married! You’re going to love it there, people are so nice.” It was just another indication she was a nice person. Because everybody was used to watching her films, children just didn’t relate to the fact that this was ancient history from the early days of Hollywood. It was kind of funny. There were a few articles in the newspapers. Some of us were reminded that Ambassador Black had previously been Ambassador to Ghana under President Ford in the mid 1970’s. Also, during the 1980’s she ran the Ambassadorial training course for FSI [the Foreign Service Institute], so she was no stranger to the world of embassies. So that was a cross she had to bear. Although she was very proud of her acting career, she was more irritated that everybody drank Shirley Temples for which she received no royalties. Anyway, so she was nominated and she was confirmed. By and large we had a delightful three years together. I arrived in late August and she arrived just a few weeks later in Prague. So that was a very long time ago, much earlier in her life. But she had that little connection to Prague and she was the kind of person who knew how to maximize that kind of incident and get some diplomatic value out of it. She was immediately thrust into her work, as I was into mine. There were people who wanted to interview her. I made one mistake early in her tour, the first week, for which she took me to the woodshed. That was in an interview with the New York Times in which, because she was new, she had me there sitting with her in this lovely palace that was the ambassador’s residence in Prague. She had me there as the New York Times correspondent was interviewing her. I would from time to time interject information to him amplifying what she was saying. Afterward she let me know that she never ever wanted to be interrupted during an interview because ‘there was only one star on the stage.’ She very firmly told me this. I mention that because I was in on all of her interviews, very close with her. We did dozens of interviews throughout her career as ambassador because, as she pointed out correctly, she had been doing media interviews since she was about three years old. She was so adept. And when people would take her picture, whether it was a journalist or just a visitor, she would know if her eye blinked, and she would say, “I blinked,” and she would have them take the photograph again. I mean she was that sensitive to how this worked. She was known because her films had been shown before the Second World War in Czechoslovakia, and her books were translated into Czech as well as other languages around the world. They did books basically summarizing her movies, with pictures of her and so forth. The Ambassador was generally dissatisfied with the quality of our classic feature films that USIS had to offer…When we showed The Whales of August, we rented out a movie theater to an invited audience. It was so incredibly dull to anybody except an American intellectual that the Ambassador decided that was it. All sorts of people were emerging from the woodwork who might not have approached the American Ambassador. For example, I mentioned the Shirley Temple films and the Shirley Temple dolls. What I wanted to append to that was one of the more moving stories that sometimes moves me to tears when I think about it. A woman came to me and she said she wanted to meet the Ambassador and she explained to me why. I went to the Ambassador and said, “You must meet with this woman,” because she really did not meet with many people. She did not send out autographs unless you sent her a stamped self-addressed envelope. She wanted to always downplay her actress background, not because she was ashamed of it or anything, but it interfered with her image as the American Ambassador. But this lady came. I took her to see the Ambassador. 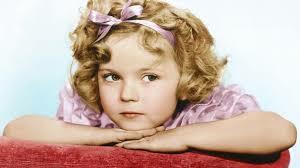 She explained to the Ambassador that when she was a little girl, she had seen Shirley Temple films and she loved them. She loved the little Shirley Temple books about the films and her Shirley Temple doll. She and her entire family were rounded up because they were Jews and they were sent to concentration camps and separated. At the end of the war every other member of her family was gassed and dead. 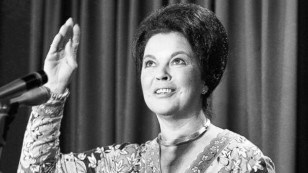 But this woman had one connection to her former life — her Shirley Temple books. Even today I find it just a very strong moving moment. But that was the sort of things we had. I remember another man she received. I told her she should receive a very elderly man who was just a fanatic Shirley Temple fan and wanted to meet her. He was so happy having met her. He got on the train to go back to Germany and died on the train…. There were a lot of these very moving moments. 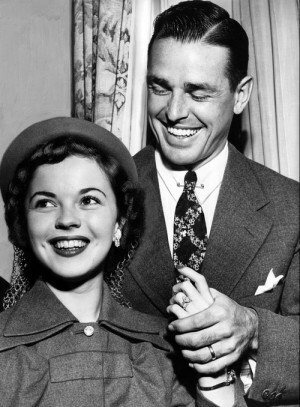 To the Depression generation of America and the world she was just a very important person, but to meet somebody whose only continuity in life was her Shirley Temple books was pretty amazing. The regime had changed in the Velvet Revolution of 1989 and by this time it was my old dissident friends who were running things in Czechoslovakia. Vaclav Havel was the new president, a number of my dissident friends had emerged as…one was deputy defense minister, another one was running a major institute, so it certainly made sense for me to go back to 124 Prague again. 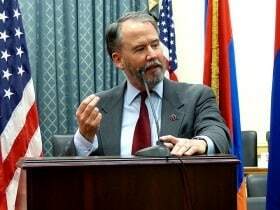 My Czech was still serviceable; I did a little bit of brush-up and then I got to Prague for Fourth of July of 1991… until ’94, when I went to St. Petersburg as it by then was, as consul general. Relations had just changed completely from what I remembered. We had an excellent rapport with the foreign ministry. We were ginning up assistance programs, we had an AID office by this time. Prague after the Velvet Revolution became something like the Left Bank in Paris during the ‘20s for young Americans, many of whom were writing poetry and novels. Things were opening up. When we first arrived in Prague I think there was literally one restaurant that was not an old state-run type of restaurant, one entrepreneurial restaurant where one could be sure that the food was fresh and served in an up-to-date way. 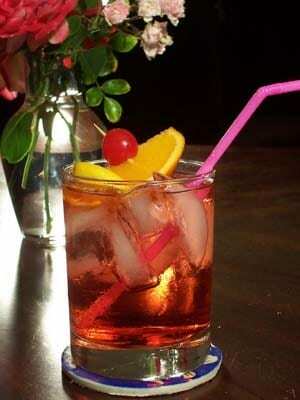 But no, it was a very happy time for me; working for Shirley Temple Black was also very good experience. Although she’s more famous as a child actor the truth of the matter is that she had spent a lot of time in government; she had worked as Ambassador to Ghana, previously she was Chief of Protocol for a time, and she… was at the UN as one of our representatives there. And so she actually spent more time in U.S. Government service than she had spent as a child star. She definitely was a very smart cookie and she was very good. If one gave her a set of talking points she could deliver them with more pizzazz and conviction than almost anyone. And, as she said to me once, “I’ve been working with scripts since I was three so give me a good script.” And we did that and she was very effective and people would take her phone calls; nobody ever turned down Shirley Temple, and she was good at cultivating her many contacts. 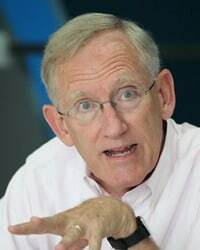 And she was also, I have to say, haunted by one of her predecessors, Bill Luers, who had been there previously as ambassador and had done a fine job and had cultivated the dissidents. Bill and Wendy Luers reappeared on the scene after the Velvet Revolution. They were very close to Vaclav Havel and at Havel’s inauguration they were more the stars than the current ambassador, and I think this wrong-footed her to a certain extent. …Well, you know, I had also been quite close to the Luers and so my job was to try to cool things down and make sure that there weren’t incidents. I was not there during the inauguration, I was still working on the CSCE, but eventually this sorted itself out and eventually Shirley Temple Black became very popular in Czechoslovakia. The one difficulty that I had there was that it was clear already that the Czechs and the Slovaks were drifting apart. 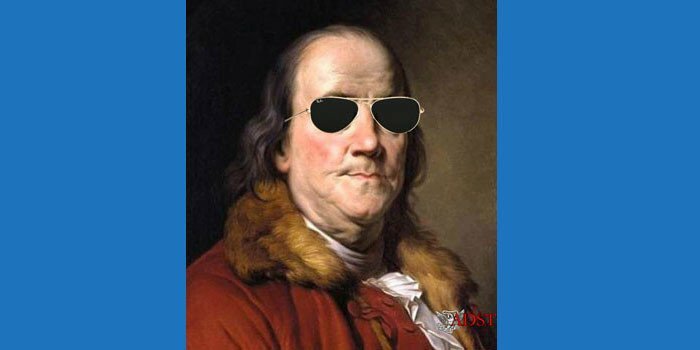 They had changed the name…they had inserted the word “Federal” or “Federative” was actually what it was into the name, the formal name of their country and this was a sign that there were some differences between the Slovaks and the Czechs. Shirley Temple Black, Ambassador Black and the State Department did not want to see Czechoslovakia divide. That would be seen as a failure of American diplomacy. We had been involved in the birth of Czechoslovakia under Woodrow Wilson. Tomáš Masaryk was the founder of the first Czechoslovak Republic and so there was a deep bias against any splitting up of Czechoslovakia. …One day in the old chancery in Prague, the fire alarm sounded and we frequently had fire drills so we all thought it was a fire drill, and we all did what we had to do, which was go back into the garden behind the chancery. But at the time there was scaffolding on the…there was work being done on the façade and so as Ambassador Black charged up the staircase to access the garden, but she hit her head very forcefully against the bar of scaffolding that was just at her level. I was right behind her and she fell back right into my arms, otherwise she would have taken a more-than-90- degree spill and, who knows, she might have cracked her skull at that point. But I did catch her and she later sent me a little note saying “thank you for what you did today,” and I do believe I saved her life.